Ab38987 recognises the carboxiterminal region of TIMP4. It does not react with other TIMPs. Synthetic peptide based on the carboxyterminal region of human TIMP4. Human TIMP4, cell media from human colorectal adenosarcoma and rat heart. Our Abpromise guarantee covers the use of ab38987 in the following tested applications. WB 1/1000 - 1/5000. 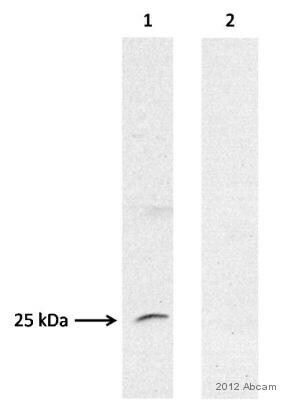 Detects a band of approximately 23 kDa (predicted molecular weight: 26 kDa). Recommended starting dilution of 1/1000 when using colorimetric substrates such as BCIP/NBT and 1/5000 when using chemiluminescent substrates. Predicted molecular weight: 26 kDa. 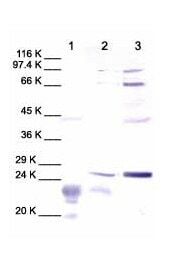 When used against the reduced protein, ab38987 identifies bands at 23 and 29 kDa, representing the unglycosylated and glycosylated forms of TIMP4 respectively. Treatment of cells with the phorbol ester TPA stimulates production of TIMP4 in some cell types but the low protein levels produced often require concentration of cell culture media to visualize the bands by Western Blotting. Dilution optimised using Chromogenic detection. Additional bands at: 20 kDa, 23 kDa (possible glycosylated form). We are unsure as to the identity of these extra bands. Publishing research using ab38987? Please let us know so that we can cite the reference in this datasheet.